Pathways is where your heart belongs. These new homes in Caledon are beautiful and inspired by a place that cherishes the past, while continuously growing. It’s a thriving area that offers every modern amenity along with a warm, calm, and joyful nature. Welcome to one of Canada’s safest places to live. It’s not just a home. It’s your family’s heartbeat. 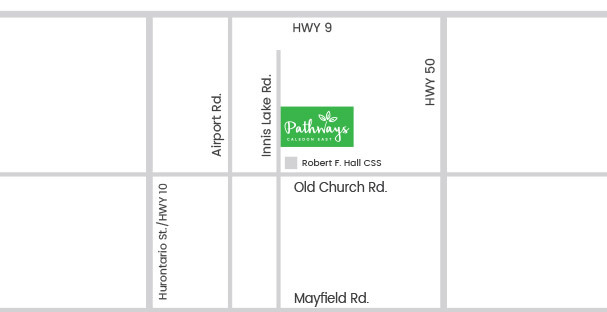 Pathways features an excellent selection of homes fit for your lifestyle. They’re designed to echo the gorgeous landscapes of Caledon while offering all of the intelligent spaces and features you’d expect in a quality, modern home. It's all here for your family to Enjoy. Put your heart into it. Creativity is at the core of Caledon. Living here means direct access to things like the Headwaters Arts Festival, Alton Mill Arts Centre, and events like the Headwaters Parade of Horses. Not many communities in Ontario can boast such a robust artistic offering. There are acres of inspirational landscapes to be seen in the Caledon area. Check out Forks of the Credit Provincial Park, The Cheltenham Badlands, Charles Sauriol Park, Caledon Lake Forest, plus a great selection of conservation areas to explore. From outdoor excursions to things likes skiing at the Caledon Ski Club, games at the Caledon Fair, a slice of pie at the delicious Caledon Strawberry Festival, and so much more, Pathways gets you closer to incredible, unique, and convenient ways to experience Caledon. A great education comes standard when you call Caledon home. Enjoy schools like Caledon East Elementary, St. Cornelius Catholic Elementary, and Robert F. Hall Secondary all just minutes away. Healthy, and hearty at home. One of the greatest joys of living in this area is access to farm fresh, organic fruits and vegetables, homemade desserts, jams, jellies, and everything you’d expect at a great Canadian farmer’s market. Try Rock Garden Farms or Albion Orchards and Country Market for the best selections. Old Church Rd. & Innis Lake Rd.